The architecture studio WXY, engineering firm C2HM, and Pentagram have partnered to rebuild the boardwalk on Rockaway Beach. When it's complete in 2017, the new boardwalk will be a five and a half mile long segmented cement walkway featuring graphic signage that can only be read from the air. 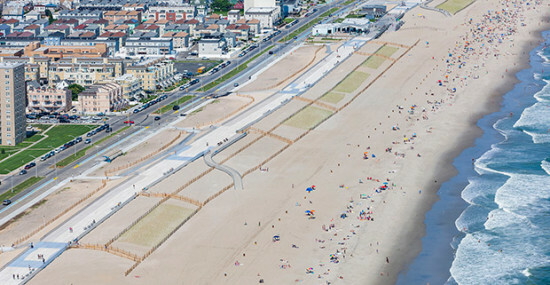 The approximately 50-foot-by-100-foot letters span the length of the boardwalk to spell out "Rockaway Beach" in dyed blue concrete. The blue reflects the walkway's proximity to the ocean while remaining clear against the surrounding pale concrete. Paula Scher at Pentagram is leading the design team. The boardwalk is part of a $140 million Rockaway Beach coastal resiliency plan that includes dune restoration, geotextile sandbags to protect buildings near the beach, and concrete retaining walls to keep sand in place during severe storms. The first mile, from Beach 86 Street to Beach 97 Street, opened just in time for beach season this year. 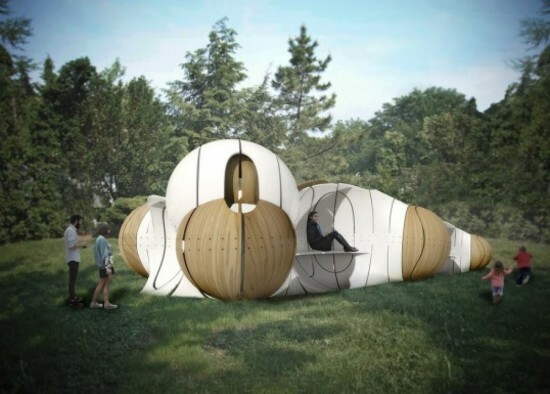 [Editor's Note: Socrates Sculpture Park on the Queens waterfront installed The Living Pyramid, a public sculpture by Agnes Denes in May, when this article was originally published. They have just announced that they will extend the life of the sculpture through the end of October. The work is Denes’ first since her iconic Wheatfield – A Confrontation in 1982, sited on a waterfront landfill in what is now Battery Park City in Lower Manhattan. 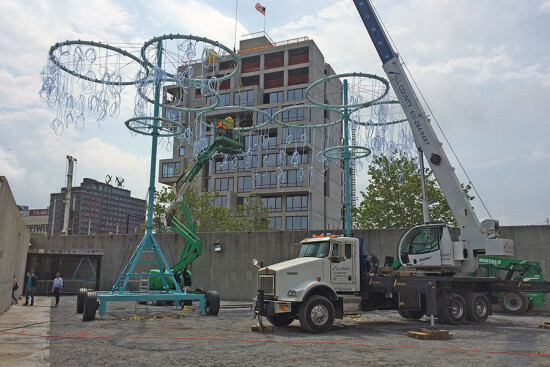 Do not miss this chance to see this important artwork before it comes down next month.] 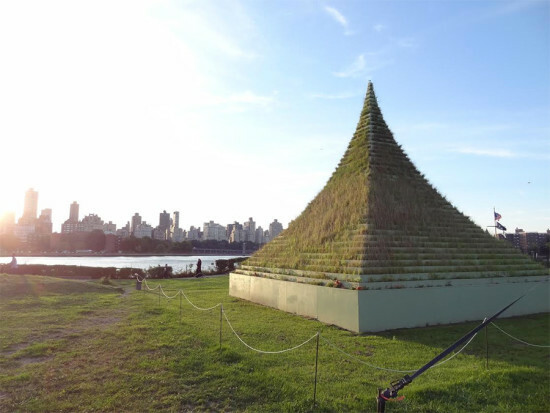 Monuments of pre-civilization feats in construction and engineering, pyramids are the latest muse of conceptual artist Agnes Denes who, in 1982, transformed what is now Battery Park City into a two-acre wheatfield. Titled Wheatfield - A Confrontation and featuring the backdrop of a construction site and jostling Manhattan skyscrapers, it’s not difficult to surmise Denes’ intentions. Likewise, her latest project, Living Pyramid resonates with a rebellious call to the wild. Made from soil and thousands of seeds, the pyramid will be erected in late April at the Socrates Sculpture Park in Long Island City, Queens. On May 17, the public is invited to plant the seeds, which, by early June, will have bloomed into wildflowers and leafy plants. Living Pyramid itself will remain on view until August 30, when cooler weather begins to encroach once again. The sculptural exhibition is Denes’ first major exhibition in the city since Wheatfield, although her work has been displayed at New York City’s prime museums including MoMA, the Metropolitan Museum of Art, and the Whitney Museum. “What [pyramids] all convey is the human drama, our hopes and dreams against great odds,” Denes said in a press release. “Transformed into blossoms, the pyramid renews itself as evolution does to our species.” Long a fixture in Denes’ work, pyramids are also central to her exhibition In the Realm of Pyramids: The Visual Philosophy of Agnes Denes on view at the Leslie Tonkonow Artworks + Projects from March 14–May 9. World Premiere of Modern Ruin: A World’s Fair Pavilion Friday, May 22nd, 2015 Cocktails 7:00–8:00p.m., Screening 8:00–9:30p.m. Queens Theatre, 14 United Nations Avenue South Flushing Meadows Corona Park, Queens Philip Johnson and Lev Zetlin's New York State Pavilion for the 1964 World's Fair in Queens' Flushing Meadows Corona Park should be more than an eyebrow raiser as those curious, disc-on-pole structures seen when driving to JFK airport. It was Munchkinland, the starting place for Dorothy's journey to Manhattan—correction, Oz—in the 1978 film The Wiz. It was an alien spacecraft tower in the original 1997 Men in Black which crashes into the nearby Unisphere. And it was the site of Tony Stark/Ironman's confrontation with his adversaries in Iron Man 2 on the grounds of Stark Expo 2010, a digitally updated 1964 World's Fair grounds (director Jon Favreau's childhood home overlooked the park). And it will appear in the new film Tomorrowland starring George Clooney that opens May 22. But the common current perception of what Ada Louise Huxtable called “sophisticated frivolity" when the buildings opened is one of dereliction, decay, and outmodedness. That is, except for a number of dedicated citizens called People for the Pavilion and architectural simpaticos, who rightly see this as a preservation issue. 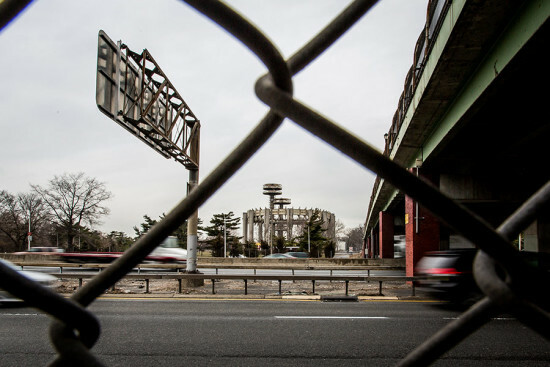 What results is a new documentary called Modern Ruin: A World's Fair Pavilion by Matthew Silva and executive produced by the makers of Modern Tide: Midcentury Architecture on Long Island (2014), Jake Gorst and Tracey Rennie Gorst, which will premiere the same day as Tomorrowland. The towers were a favorite of master-builder and fair impresario Robert Moses, who saw these structures as one of the few 1964 World's Fair buildings intended to live beyond the event. Paul Goldberger said it used "advanced engineering combined with a very exquisite sense of architectural composition, to make something that was both aesthetically and structurally quite beautiful and fully resolved." The pavilion consists of three components made of reinforced concrete and steel: the "Tent of Tomorrow," the Observation Towers, and the "Theaterama." The elliptical “Tent of Tomorrow” measured 350-feet by 250-feet with sixteen 100-foot-tall columns supporting a 50,000 square foot roof of multi-colored fiberglass panels—like a Rose window over a circus tent—once the largest cable suspension roof in the world. The Observation Towers are three concrete structures, the tallest at 226 feet high, with observation platforms once accessed by two "Sky Streak capsule" elevators. The adjacent “Theaterama” was originally a single drum-shaped volume of reinforced concrete where pop artworks by Andy Warhol, Roy Lichtenstein, Robert Indiana, and Ellsworth Kelly—plus art from local museums—were exhibited alongside a display from the New York State Power Authority featuring a 26-foot scale replica of the St. Lawrence hydroelectric plant. 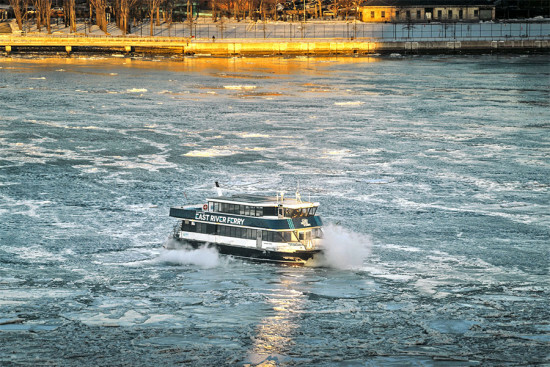 A 360-degree film about the wonders of New York State, from Jones Beach to Niagara Falls, was screened inside. Warhol’s specially-commissioned Thirteen Most Wanted Men series depicting criminals' mug shots straight on and in profile, displayed on the exterior had a fate reminiscent of Diego Rivera's censored murals at Rockefeller Center: Nelson Rockefeller had it covered over, here because too many Italian Americans were depicted as criminals. (In 2014, the complete series was displayed at the Queens Museum, just 200 yards from the New York State Pavilion.) The Theaterama was converted to the Queens Playhouse in 1972 and is now the Queens Theatre where Modern Ruin: A World's Fair Pavilion will be screened. Connecting the complex was a floor made of 4-foot-by-4-foot terrazzo panels that formed a map of New York State. In fact, it was a Texaco roadmap and was a great hit with people finding their home towns and navigating across the state. At the end of the fair, the floor was supposed to be moved to a building in Albany, but instead was left and became a roller rink—terrazzo is a great skating surface. The site was largely intact until the mid-1970s (the Grateful Dead and Led Zeppelin performed there), but its fate was part of New York City's downslide. The roller rink closed, the roof was taken out. Left open to the elements, the mapped floor was destroyed. Since that time, the complex has continued to deteriorate, but a handful of dedicated citizens have devoted themselves to resurrecting the space. Volunteers for the New York State Paint Project are sprucing up the tent with a fresh coat of paint. 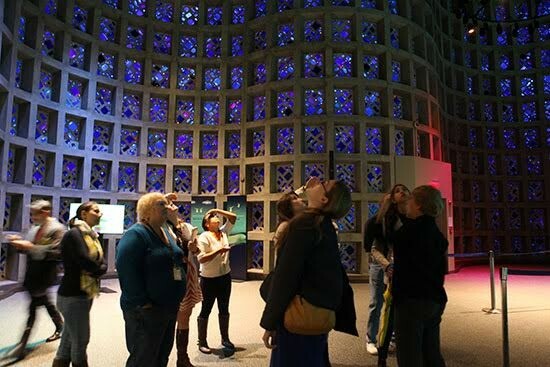 CREATE Architecture Planning and Design came up with an idea to make it into an Air & Space Museum—that plan went nowhere. In 2014, New York City government announced a pledge of $5.8 million towards rehab of the structure, and Governor Cuomo’s office pledged $127,000, but estimates for the complete rehabilitation have climbed to a staggering $75 million. The film is a loving portrait with intelligent interviews with Frank Sanchis (World Monuments Fund), Robert A.M. Stern, and Paul Goldberger laced among those who created, remember, and are saving the site. A new tower designed by FXFowle will bring a touch of design to Long Island City’s ever-growing skyline of glassy and generic residential buildings. For starters, the 35-story luxury rental tower is differentiated by a rust-colored steel that encases the podium and runs up its sides, framing three glassy expanses. Yes, there is still a lot of glass on this one too, but FXFOWLE said the building is inspired by the area's “original industrial heritage and its new position as a fresh and modern NYC locale.” The profile of the building, with three stacked volumes, reminds us of Chad Oppenheim's Williamsburg Hotel project proposed a few years ago in Brooklyn. The designers and developers of the Purves Street Residential Development are also quick to point out the project's sustainable features. To hit LEED Silver certification, the tower's podium will be covered in an expansive green roof and common areas will be partially powered by solar and wind energy that is created on-site. In renderings, it is easy to spot a helix-shaped windmill on top of the building. But as the New York Times explained last year, the impact of these types of windmills that are now appearing across New York City can be pretty mixed. Inside the Long Island City building, the apartments and amenity spaces (of which there are many—in fact, there is a separate “amenity building”) are decked out with industrial materials like concrete and steel, alongside lots of wood. The building broke ground, not coincidentally, on Earth Day and is expected to be completed in two years. 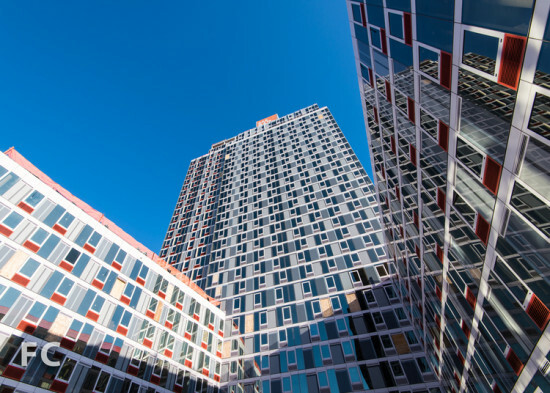 The construction-watching site Field Condition recently toured phase one of the Hunters Point South development in Long Island City, Queens where a pair of SHoP-designed towers are wrapping up construction. The taller of the two buildings, Building A, stands 37 stories and has a primarily gray facade with pops of color from PTAC units that have been tinted orange. Building B has a much darker presence, with a primarily glassy black exterior. Field Condition noted that work is currently focused on finishing interior spaces before tenants start moving in this spring. In December, DNAinfo reported that 92,700 applicants had been received for the development's 924 affordable units. Check out the buildings—and their views—below. 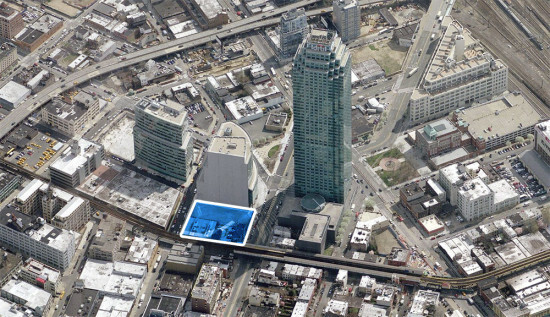 Yet another tower could rise in Long Island City, Queens. 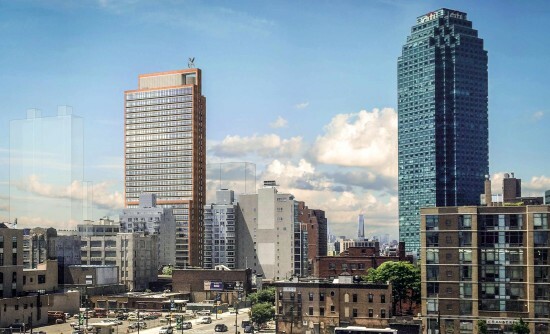 Citigroup is expected to sell a prime development site next to its SOM-designed, 51-story turquoise office tower that dominates the neighborhood’s skyline. The New York Times reported that when Citi built the structure in 1989, the city expected Long Island City to blossom into a major commercial hub. That hope did not pan out. But the neighborhood has seen a boom in residential development in recent years and now Citi wants to take advantage of it. The bank will reportedly sell the development site for $150 million, likely giving way to an apartment or hotel high-rise. 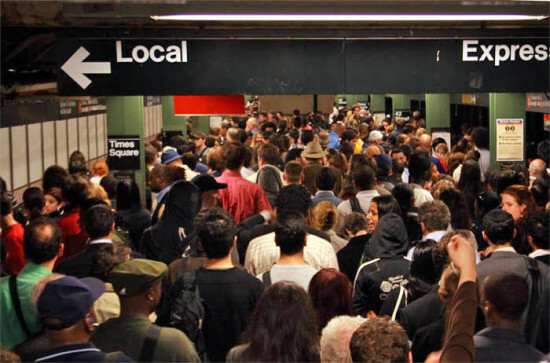 Overcrowding on New York City subway trains is becoming a major problem for commuters. According to new data from the MTA, there were 14,843 weekday delays caused by overcrowding in December alone. The New York Post found that the number is up 113 percent from the same period a year ago. 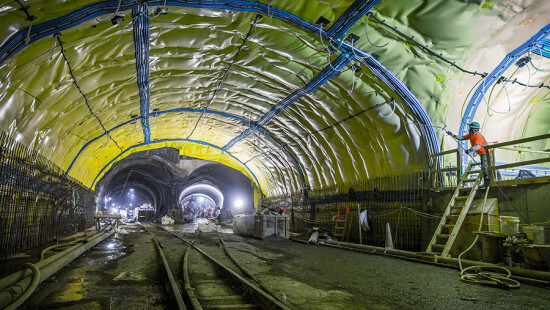 Fixing the overcrowding will not be easy for the MTA as it is trying to accommodate record ridership and still dealing with damage from Superstorm Sandy.